All of the information isn’t tallied yet, but the state climatologist says it is evident that December was a record month for snow. Harry Hillaker says the snow right up through the final week of the month ensured a top spot. 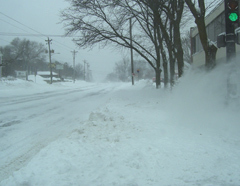 Hillaker says the statewide average for December of 2009 is 23.3 inches of snowfall. That puts the month in second place for the snowiest calendar month, surpassing February of 1962 when the state got an average of 22.2 inches. The all-time snowiest month was December of 2000, with 25.5 inches. A couple of big snowstorms help push the totals up. He says the blizzard on the 8th and 9th brought an average of 10.2 inches, and then the Christmas storm brought an average of 8.2 inches. Hillaker says the total alone for those two storms of 19.4 inches would have ranked second highest in the month of December. Hillaker says the big December total has the snowfall for the winter well above normal. Hillaker says November was the second least snowiest month on record with just a trace, and there was just a trace in October, but we are still ahead of the normal total for the season with about two feet of snow. Normal for this time of year is around one foot of snowfall. While the snowfall was above normal for December, the temperatures were about average. Hillaker says the temperature is running about two-and-a-half degrees below normal, but that won’t even rank in the top 20 as far as Decembers go. The state began keeping weather records in 1887-1888.